If you're looking for variety in a vacation, cruise to South America. It's a continent of extremes. Waves quietly lap the pristine beaches of Uruguay's resort towns while the rhythms of Samba rattle windows in Rio. In Chile alone, you'll find snow-capped mountains and the world's driest desert. You can party in Paraty one day and hike through a remote rainforest the next. Do you love the chic atmosphere of the Cote d'Azur? Then you should visit South America. Do you love the rugged, adventurous spirit of Australia? Then you should visit South America. Do you love the nightlife, music, and dance of the Iberian Peninsula? Then you should visit South America. When cruising to South America, you simply have to take in a few live music and dance performances. In Buenos Aires, Argentina, it's all about the sultry art of tango. You can watch the pros at milongas (dance halls), catch a more casual performance on the street, or take lessons yourself. In Rio de Janeiro, it's all about that Samba. Want to know more about how Samba evolved in Brazil, and its significance within the celebrations of Carnaval? You're in luck! We just happen to have an article on history of, and insider tips for attending, Rio's Carnaval. Macchu Picchu, in Peru, is one of the Seven Wonders of the New World. The 15th-Century Incan Citadel is truly a sight to behold. And you can travel to this sacred site with Azamara, through our Land and Sea Packages. The trip includes two days to explore Macchu Picchu and four unique local experiences. Each South American country has its own specific cuisine and traditions, and we love them all. One of the joys of cruising in South America is being able to indulge in authentic, delicious meals in each port of call. In Chile, be sure to try empanadas, humitas, and Porotos Granados. Not sure what those dishes are? We've got you covered! We dig into Chilean cuisine in this article on the history and culture of Chile. One of the best ways to explore local cuisine is through our Cruise Global, Taste Local shore excursions. You can visit local farms in Patagonia, sample fresh produce at a market in Peru, take a cooking class in Uruguay, and more. When it comes to some cities, if you haven’t seen it at night you haven’t seen it at all. Rio de Janeiro is one of those cities; it comes alive at night. If you're dreaming of sipping caiprinha cocktails and shaking your hips to the sounds of Samba, a trip to Rio's Lapa neighborhood is what you need. It's known as the "cradle of carioca Bohemia" (carioca is Brazilian slang for locals) and is packed with trendy bars, nightclubs, and restaurants. The famous Rio Scenarium nightclub has three floors of dance space, and it's easy to visit with our Cruise Global, Nights Local shore excursion. 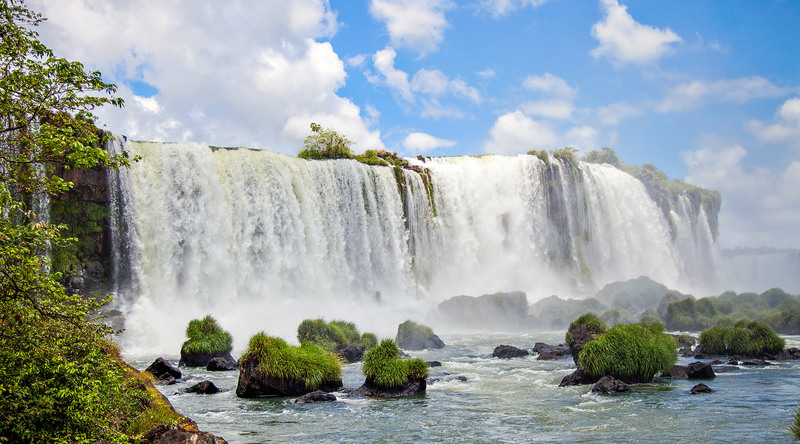 The breathtaking Iguazu Falls lie on the border of Argentina and Brazil, and consist of 275 falls along 1.67 miles of the Iguazu River. The Devil’s Throat is the most impressive of them – a U-shaped, 82 meter high, 150-meter wide waterfall. Take in the spectacle of these incredible waterfalls from both sides when you visit with our Land and Sea Package. You'll spend one day exploring the falls by boat from the Argentine side. The next day, you can compare the view as you approach by boat from the Brazilian side. One of the best things about a South American cruise is getting to experience the many amazing beaches the continent has to offer. Punta del Este’s Brava Beach is famous for the Mano de Punta del Este, or, “The Hand”. The sculpture is an award-winning work by Chilean artist Mario Irarrázabal and makes for a great photo op. The beach is also lined with great restaurants and boutiques. Ilhabela means “beautiful island”, and this Brazilian port lives up to its name. Visitors love the luscious jungles, state park trails, stunning waterfalls and, of course, several fantastic beaches. One of our favorites is Curral Beach, renowned for its natural beauty and warm waters. It's a stop on our Cruise Global, Adventure Local tour in the region. Rio’s Copacabana Beach is perhaps the most famous in the world. At 4km long, the beach is perfect for surfing, sunbathing and people-watching. This beach also hosts one of the most exciting New Year’s Eve parties in the world! South America is home to some of the world's greatest wine regions — though some are more well-known around the world than others. Argentina, of course, is renowned for its Malbec wines. And Chile is no viticulture slouch either, producing excellent Merlot, Cabernet Sauvignon, and Sauvignon Blanc wines. Flying a little more under the radar, though, is Uruguay. Uruguayan wines may not be as famous as some other South American varietals, but their red wines made from Tannat grapes are particularly beloved locally. Sip them while you can, as they're hard to come by overseas. In Valparaíso, Chile, guests can explore Chilean wines during a blind tasting. You just might discover a new favorite! In Montevideo, Uruguay, guests can visit a family-owned winery in the Cuchilla Pereira region to sample their offerings and learn all about the winemaking process. Are you feeling the familiar tug of wanderlust yet? We don't blame you. South America is a captivating destination. Join us on our new ship, the Azamara Pursuit, and see it in style! Browse voyages here.